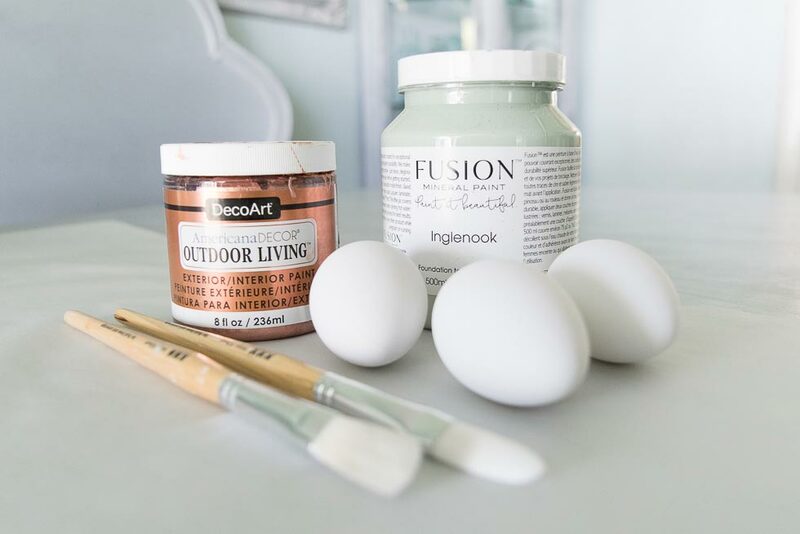 Sinkology is proud to present Kendra Williams, a home decor expert, DIYer, furniture refinisher, and busy mom as a guest blogger. 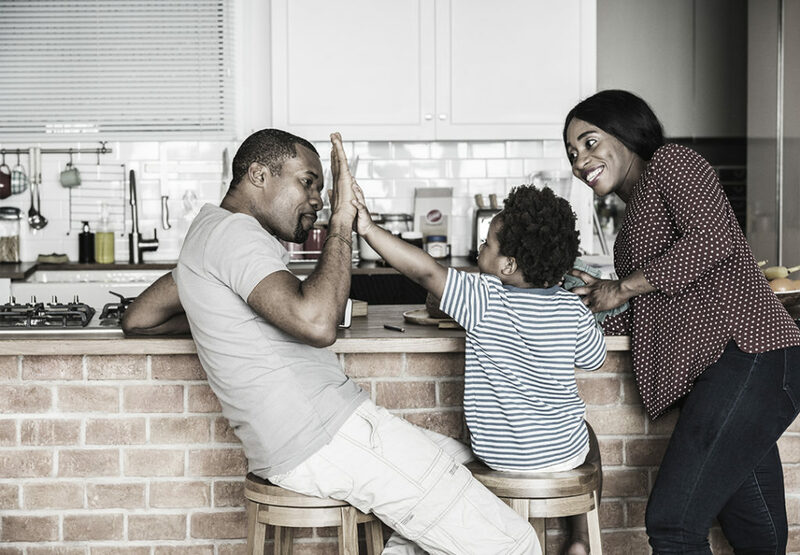 Kendra runs the blog at Momtique and she is here to share some design ideas and inspiration around designing your home with copper and around your copper sink. Spring is in the air! I can’t believe a quarter of the year is already behind us. Time is flying by and I can’t say that I’m sad about this change. I am happy to say that sunshine and warmer days are ahead of us. With this change, we know Easter is coming and stores are beginning to display bunnies and eggs at every turn. You know what that means? It’s time to think about an aster centerpiece for your dining room table. 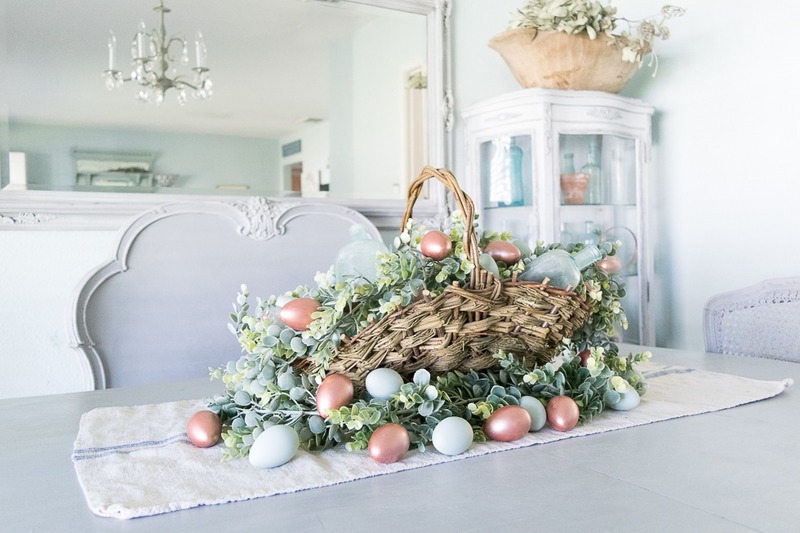 I am going to show you how to make your own Easter Egg Basket Centerpiece. 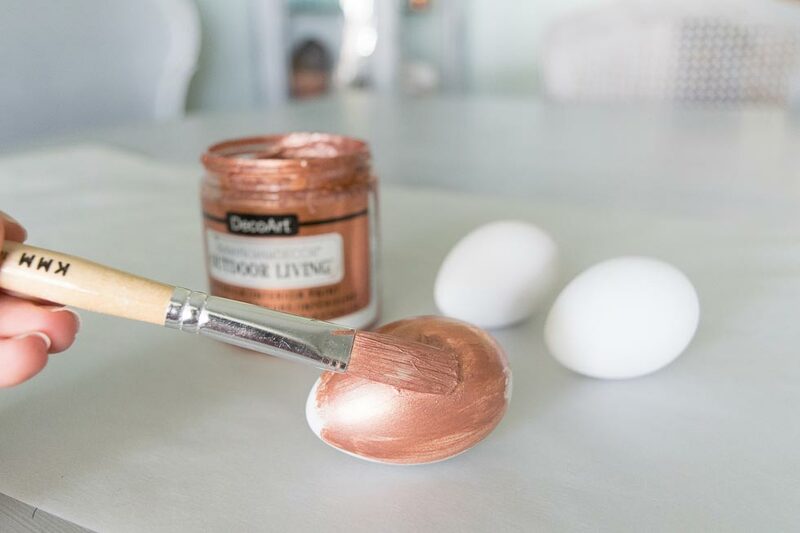 I love to incorporate copper in all my DIYs here on Sinkology. Copper has so many beautiful hues and can be used to add elegance and depth to any decor. 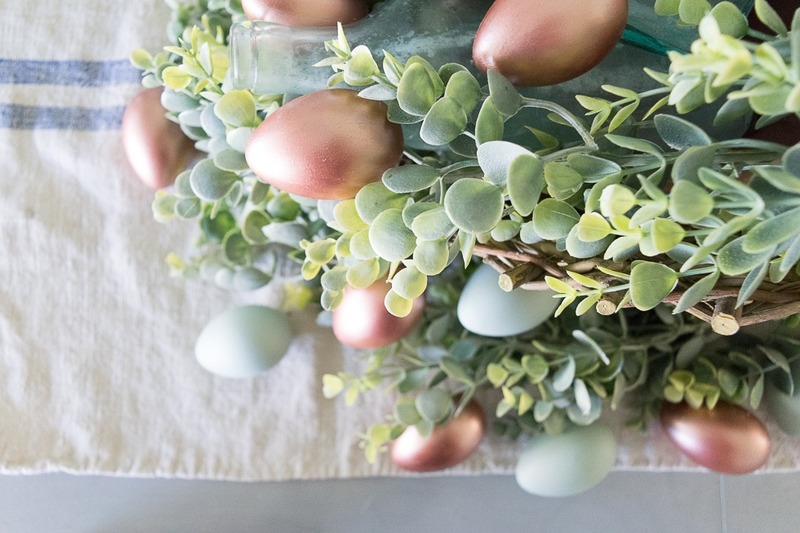 Although this centerpiece doesn’t contain any actual copper, there will be no shortage of warm copper tones in this Easter basket. Before you begin, decide how you want your individual Easter basket to look. I wanted mine to look natural, yet feminine. The basket I chose had an organic, garden feel to it. Perhaps, you may want something a little more simple or something with a farmhouse feel. Next, decide on greenery. In this centerpiece, I used two light green faux garlands. These garlands are some of my favorite greenery. They have a dusty white hue that I love. I have used these to stage many spots in my home and business. Other options would be real flowers, darker greenery, or even succulents if you would rather have a modern feel to your basket. The last item to think about is paint color. 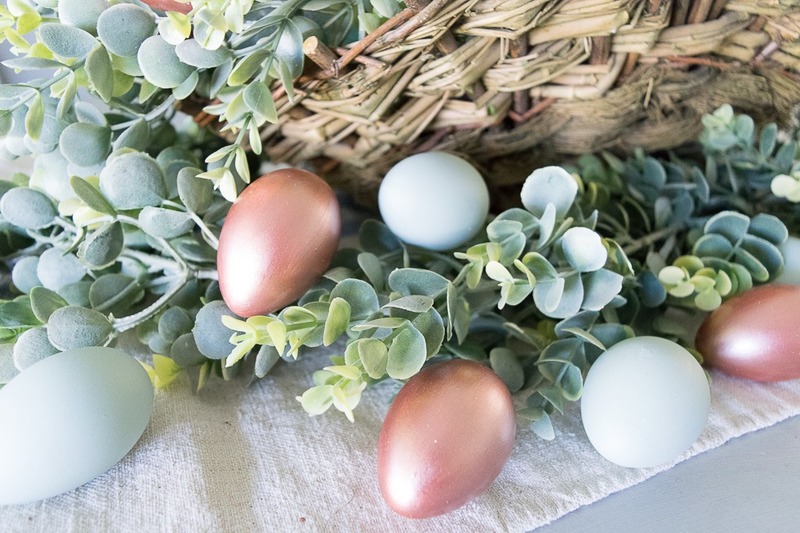 Although I used copper and mint, you can customize your centerpiece with whatever paint colors suite your personal decor style. What I love about this centerpiece is, a hundred different people could create a basket with their own unique style in mind and each one would look different from the next. paint. 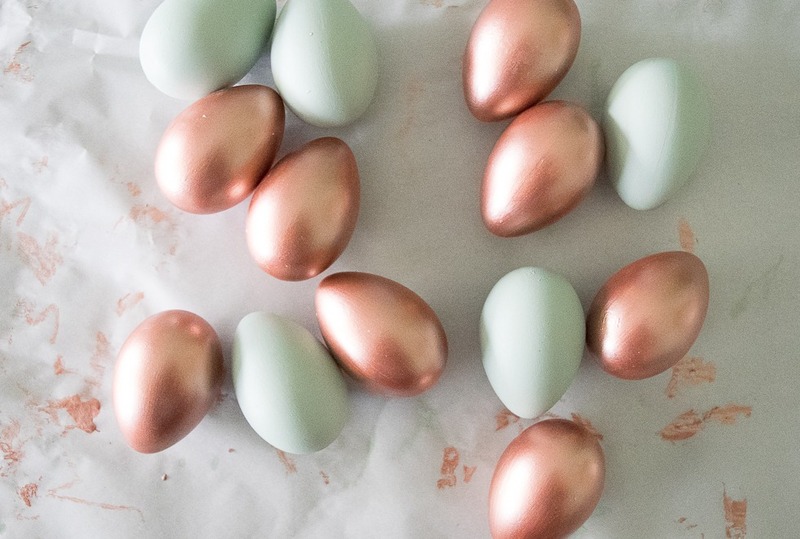 The copper eggs required about thirty minutes to dry between each coat. The painting is easy, the waiting can be difficult, at least it is for me. Make certain to put down some parchment paper or something to protect your surface. I wasn’t patient enough to paint one side at a time, so I painted each egg completely, then let it dry. After the eggs are dry, it is time for the fun part…staging! I quickly realized I was going to need to add some items at the bottom of my basket to help prop up the greenery and eggs. My terra- cotta pots and blue glass bottles came in handy. Other items you could use to help fill up your basket are: books, fabric, or more greenery. Whatever you use, make sure that if it’s seen, it complements the centerpiece. For the table runner, I used an antique grain sack. 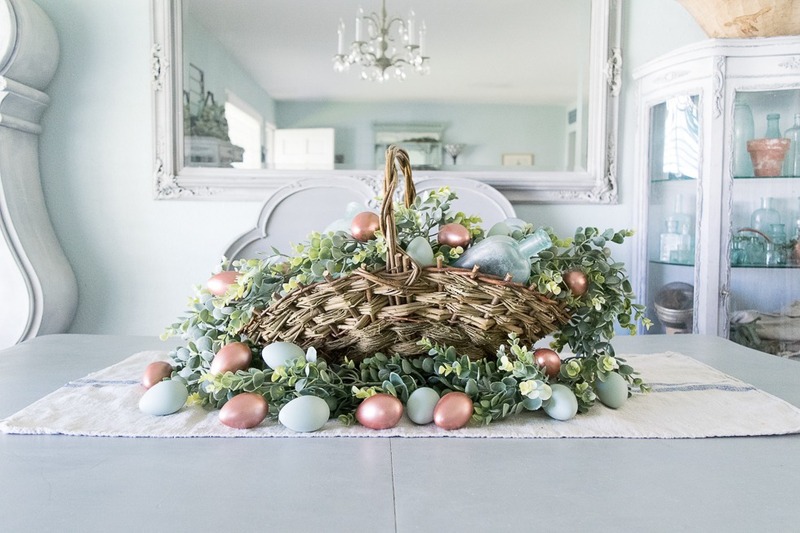 This DIY centerpiece is an easy and inexpensive way to add a little bit of Easter and Springtime into you home. 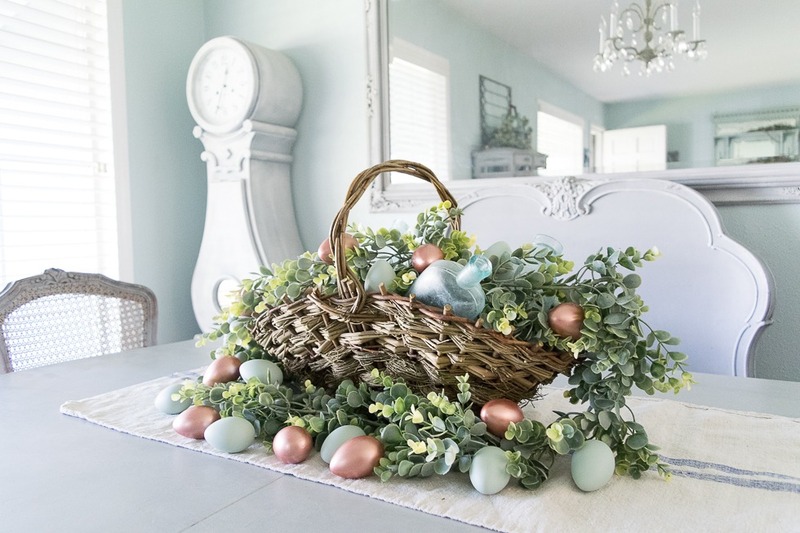 I encourage you to make your own Easter Egg Basket Centerpiece using your personal decor style!